Standard reports allow you to view results by individual reviewers, review summary, or demographic breakdown. 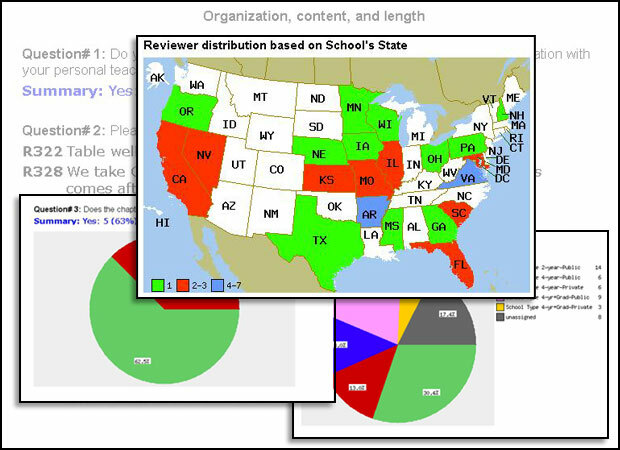 TextReviews provides several reports that can be customized to your needs. Every project is delivered with individual reviewer response summaries, plus a Review Summary report and Reviewer Analysis report. The Review Summary report is a 'cut and paste' collection of all textual responses as well as all of the numerical analysis for quantitative questions. It also automatically integrates all of the graphs (color or B&W) and reviewer subgroups an editor has created. The Reviewer Analysis report is a complete demographic breakdown of all reviewers. It includes a map view, graphs of the distribution of enrollment, decision type, school type, years taught, etc. as well a complete profile description of every reviewer. All TextReviews reports are automatically formatted for Word and can be viewed online or downloaded at any time.